An "Andover Pride" banner. Photo by Rosanna Wang. Andover High School has been in the headlines for weeks as a result of an alleged hazing incident that took place last summer at a basketball camp. We grew used to the sight of news vans parked across the street, as local, regional, and national media eagerly tried to learn about the allegations and gauge student response. Most students expressed shock and revulsion upon learning of the incident. The students seemed to agree that his was an anomaly, but at the same time the whole school was shaken. However, most students want to put the events behind them and to focus instead on the school’s achievements. 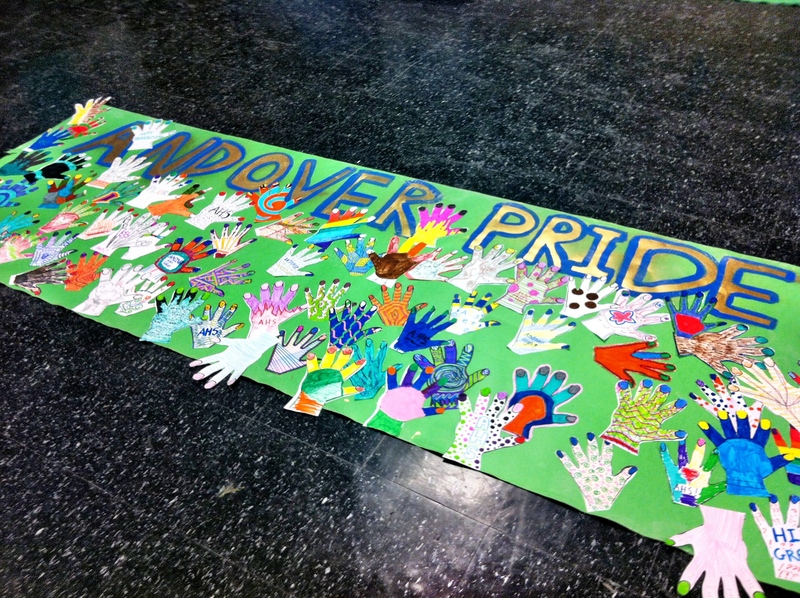 In order to combat some of the negative feelings and to initiate positive spirit, art teacher Ms. Dunning has been working on two banners across the top of which are dispalyed the words “Andover Pride.” Students have the option to decorate a cutout hand and attach it to a banner. One banner is displayed at the top of the main stairs, and the other is on display in the cafeteria. Hopefully, this art project will remind AHS of all that it has to be proud of and will reinforce our sense of community. “We want [to emphasize] ‘Andover Pride’ because it’s a good school with good kids,” Ms. Dunning emphatically concluded.